Ah, Valentine’s Day. The most romantic day of the year. For parents, “the most romantic day of the year” means helping your child fill out Valentine’s Day cards for every single kid in their class. It isn’t the date night good old days, but I love doing it. A major part of who I am as a parent is defined by the joy I feel when making sure my kids enjoy these holidays. Just because they are enjoying it, though, doesn’t mean Mom doesn’t have a trick up her sleeve. Because MomDot often focuses on the super fun and paper valentines day crafts, I have to deter to other bloggers to show case for you some of the fun ways to bring some education into Valentines Day. 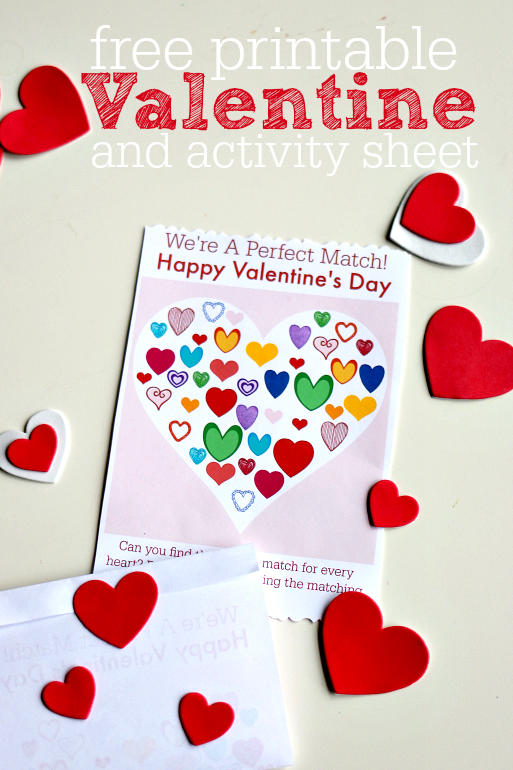 1) 2 in 1 Printable Valentine and Activity Set. Pay it forward to other parents by letting your kids take these printable Valentine cards to school with them. Not only do they function as an outstanding and festive, the puzzle will help your kids stay on an educational path. 2) Preschool Do a Dot Printable: Valentine’s Hearts. Preschool is the magical time when kids become aware of their surroundings, and notice the excitement of holidays. 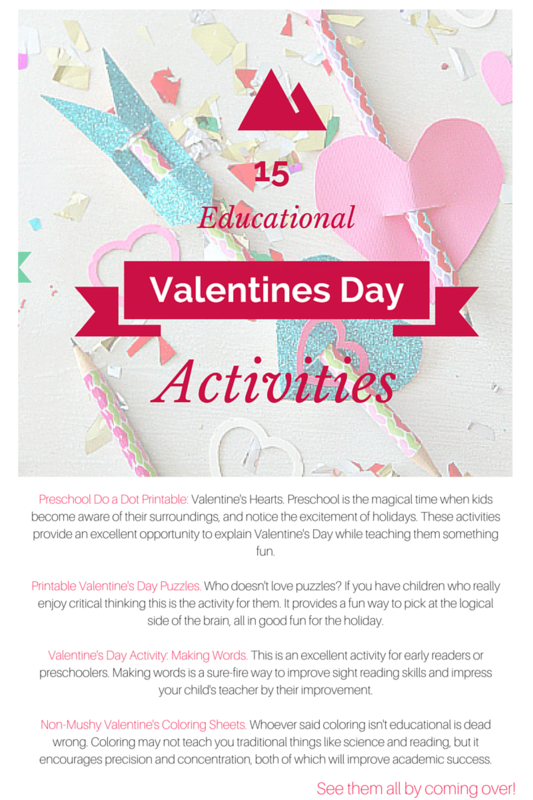 These activities provide an excellent opportunity to explain Valentine’s Day while teaching them something fun. 3) Printable Valentine’s Day Puzzles. Who doesn’t love puzzles? If you have children who really enjoy critical thinking this is the activity for them. It provides a fun way to pick at the logical side of the brain, all in good fun for the holiday. 4) Valentine’s Day Activity: Making Words. This is an excellent activity for early readers or preschoolers. Making words is a sure-fire way to improve sight reading skills and impress your child’s teacher by their improvement. 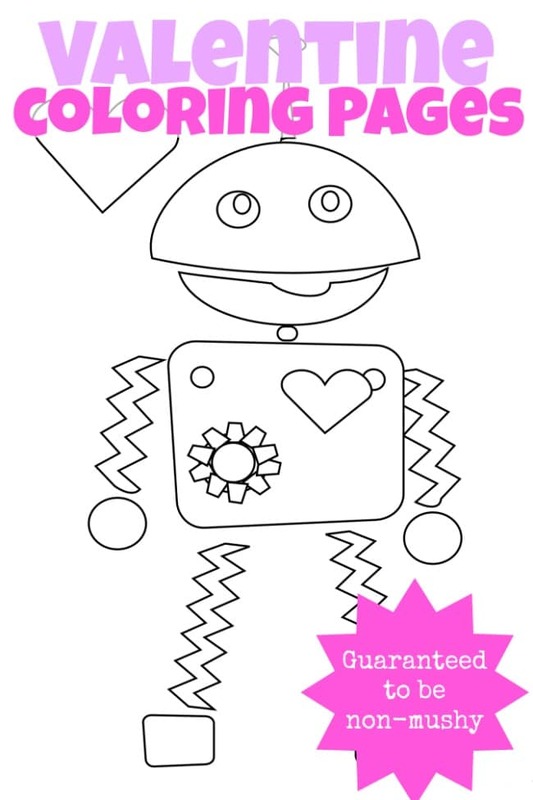 5) Non-Mushy Valentine’s Coloring Sheets. Whoever said coloring isn’t educational is dead wrong. Coloring may not teach you traditional things like science and reading, but it encourages precision and concentration, both of which will improve academic success. 6) Valentine’s Day Sensory Bottles. Your little ones will love these sensory bottles. The beautiful colors, the sparkle, and the shapes are sure to draw them in for hours on end. 7) Jar of Hearts Valentine’s Day Math Printable. Use this worksheet and hearts in different colors and sizes to encourage a love of math in your child. I’m not sure I’ve ever loved math more than I do with this activity. 8) Valentine’s Day Memory Game. Memory games are great fun, and you can either play with your child or let a sibling compete against them. Whoever gets the most matches wins! This promotes memory skills and some good old fashioned healthy competition. 9) Another variation of the Valentine’s Day Memory Game. Once your child has grown tired of the first memory game (or has completed it one too many times) this variation will fill the gaps. With a change in design, your matching game loving children will be begging to continue playing. 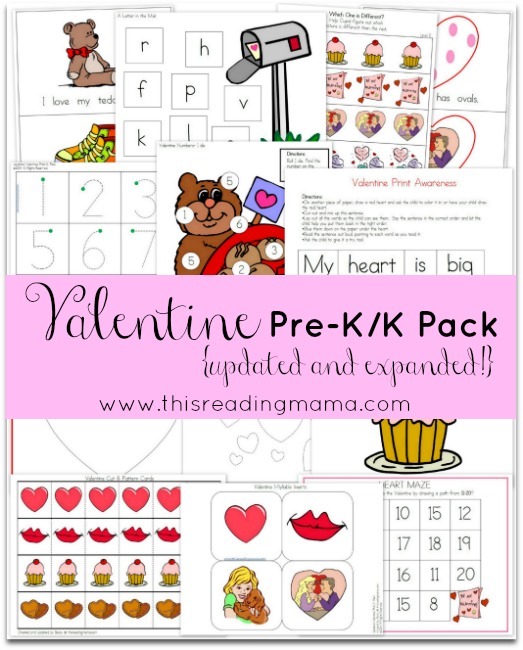 10) Valentine’s Day Pre-k/k Educational pack. A lot of us pre-k and kindergarten parents rely heavily on these types of educational packs to keep our kids from going crazy at home. There is no better resource than this one for quality, and grade appropriate packets. 11) Valentine’s Day Tot Kit. This packet is very similar to the one above, but is for a littler younger of a crowd. Don’t leave your younger child out, this will keep them entertained for hours as they are learning just like their older brother or sister. 12) Valentine’s Day I Spy Game. I-Spy with my little eye…cupid’s arrow! Any child can enjoy this activity, as it uses shapes instead of words to complete the I-Spy challenge most likely inspired by the infamous Cupid himself. 13) Valentine’s Activity Pack. Enjoy some great educational worksheets as well as Valentine card templates in this pack. Your child will go wild over this activity, especially if they have a special someone that they want to give a Valentine to. 14) Valentine Sudoku Printable Puzzle. Get your older children on board with another critical thinking puzzle. Sudoku is fun, challenging at times, and extremely addicting. It is sure to give your kids something that will inspire them to buy a Sudoku puzzle book the next time you visit the store. 15) Valentine’s Day Alphabet and Number Matching Game. Using a large heart, let your kids test their matching skills with the alphabet and their numbers. Add a little extra challenge by timing your older kids. 16) Montessori Inspired Valentine’s Day Learning Printables. Montessori is beloved by many, and provides an excellent approach to learning. This set of printables will keep you on track for your preschool and early elementary aged children. 17) Valentine Candy Science. Do you have a child who loves candy, and buying science kits at every possibly opportunity? You do not want to miss out on this activity, where you’ll be able to explore and recreate reactions with your candy. 18) Color my Valentine. This coloring project takes educational coloring to a whole new level. Using matching skills, and the correct colors, fill in the picture in the correct way to reveal a beautiful end product. 19) Crystal Hearts Valentine Science. Have you ever made crystals with your children? You probably already have all of the necessary ingredients in your home already! Kids are amazed by this process, and seeing them watch the transformation is always an amazing experience. 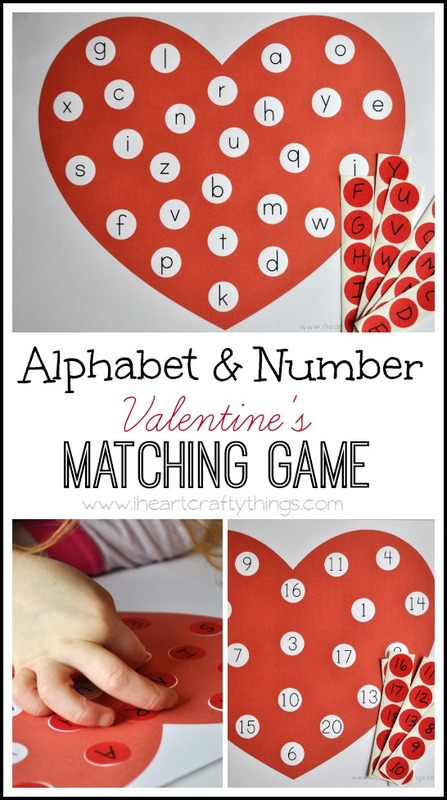 20) Valentine Hearts Letter Match Game. Encourage fluency in your early readers to know their entire alphabet, whether uppercase or lowercase. This matching game will help them become proficient in no time. « How to color toothpicks that impress party guests!